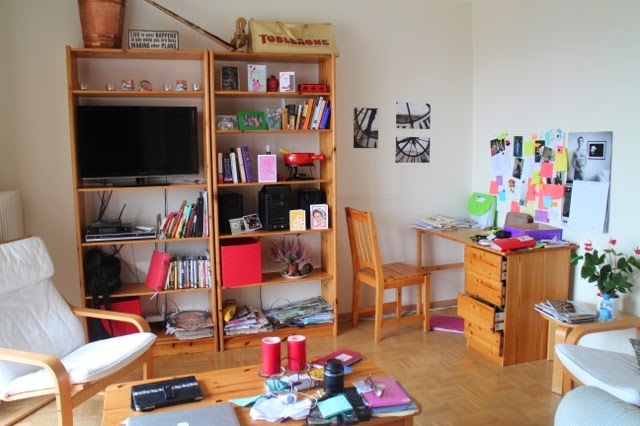 As you can well imagine, joining the staff at a school located in Switzerland means that interviewing, consulting and just basically communicating happen through emails, by telephone or over Skype. Certainly that has been the case for me. I have never seen the town I will be living in except on Google Maps. I also did not meet any of the people I will be working with until May. 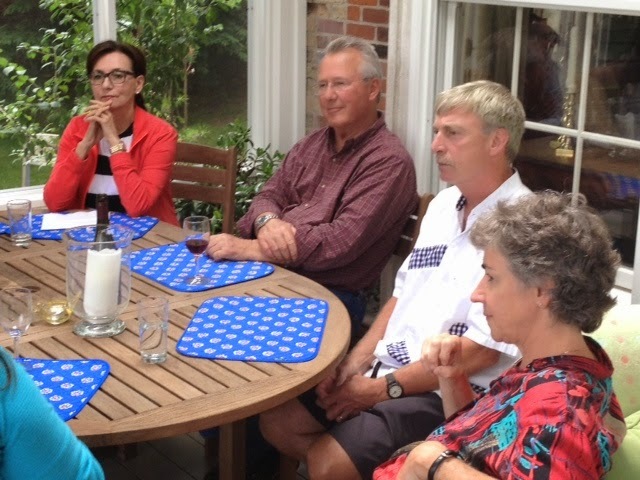 My first person to person encounters occurred on May 5th when the Toronto staff of Neuchâtel Junior College organized a reception for incoming students and their parents at Snell Hall on the grounds of St. James Cathedral. 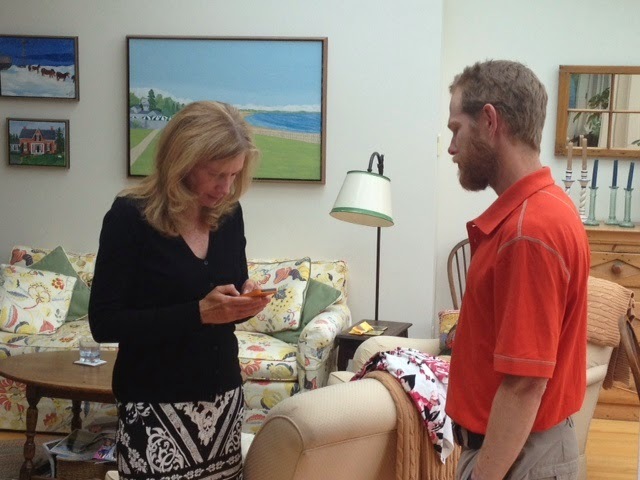 The Head of School, Bill Boyer, met me beforehand in his office on Victoria Street. He put me at ease immediately with his open and warm manner. He said later that he has the best job in the world, working as he does in such a glorious setting. Still, as the man in charge, he is the face of the school. And a wonderful ambassador he is! Arriving early at Snell Hall, I saw the many name tags on display. One name jumped out at me: Andrew Sisley. He was once a basketball teammate of my son's, but is now President of NorthStar Currency, a company which assists students with the financial side of living in Switzerland. Like others I met that evening, Andrew is a Neuchâtel alumnus. I was happy to see him "all grown up" and to find another personal connection with the school. Scenes from the reception on May 5th. That's Mark Keilburger speaking. The evening reception was very enjoyable and informative. Through a video, we heard from the class of 2014, as they assured the incoming group that they were making the best decision of their lives. Mark Keilburger of Free the Children used words and film to encourage students to opt for the humanitarian trip to Kenya over the Christmas break. 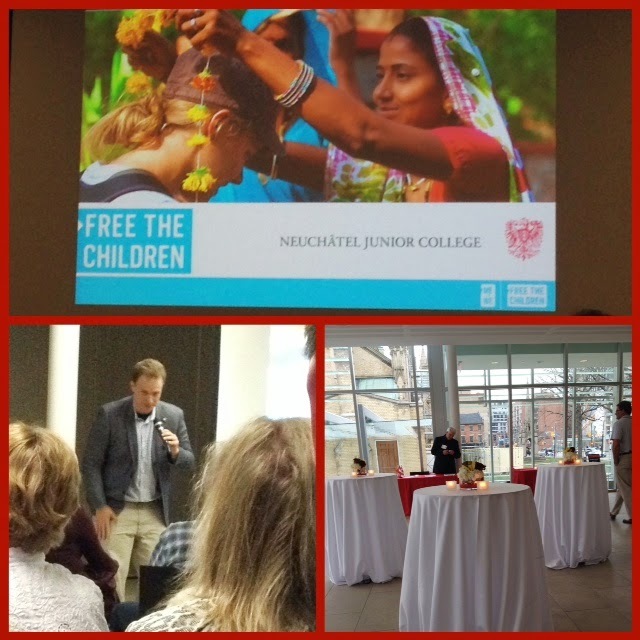 Dayle Leishman (Director of Canadian Operations) and Brenda Neil (Director of Admissions) both spoke as well. They are the staff on the front lines, the first contact for students who are interested in the school. After the formal part of the evening concluded, I mingled with the young women and men who will be in my classes. We will be on this adventure together, and I am eager to know them all. They and their parents had many questions for me and I did my best to field them, although I am a "newbie" myself, in many ways. Barb's pic of the apartment. Love the Toblerone bag! 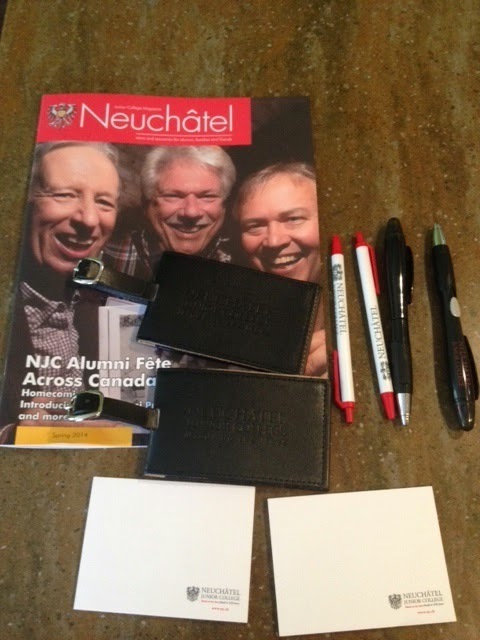 Contents of my Neuchâtel swag bag. 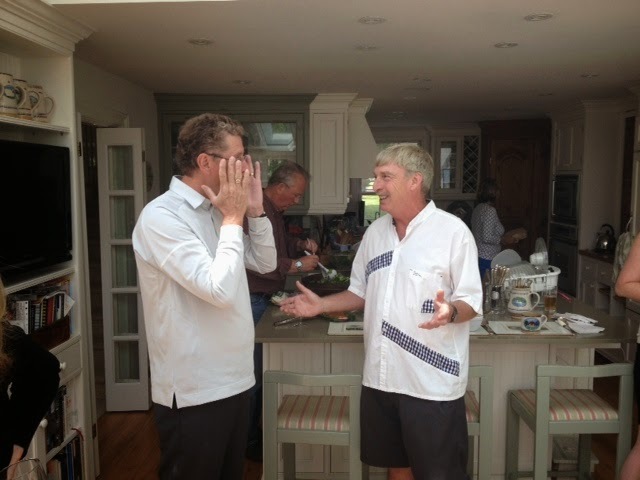 In late June, I arranged to meet two Neuchâtel staff, both on the same day. Barb Swanson, Director of University Counselling and Guidance this past year, joined me for breakfast and was most helpful in giving me the lay of the land. I will be moving into the apartment she is vacating; she even had pictures for me! Don Martin, a History teacher, met me for a cool drink mid-afternoon. He will be returning to Neuchâtel this year and we will be working on NESDA together. I will write more about that group after I figure out what it is. 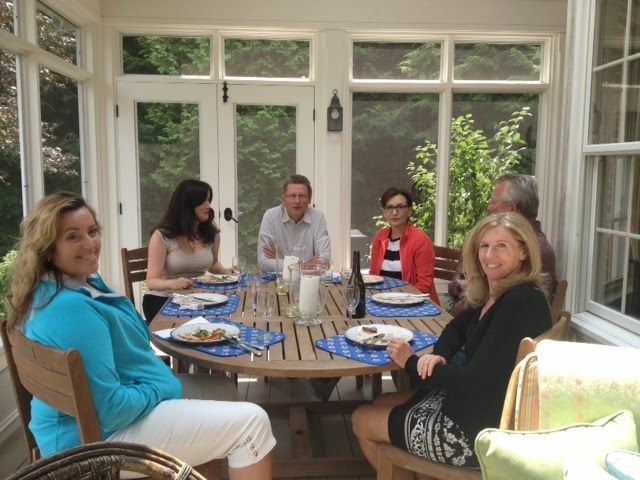 Finally, last Tuesday, Bill organized a luncheon for the incoming staff and their spouses. I am one of five new teachers coming to Neuchâtel this September. Since this blog entry is so long already, I will not go into detail about our delicious luncheon. But I came away from the day very eager to work with the people I met there. I am sure Paul, Jen, Terry and Aaron and their families will all feature in later entries, as we enter this new phase of our careers together. Here they are in pictures. Enjoying meeting each other. Jen and Dayle are the smiling pair in the foreground. Terry caught a fish THAT BIG!! Bill is amazed.